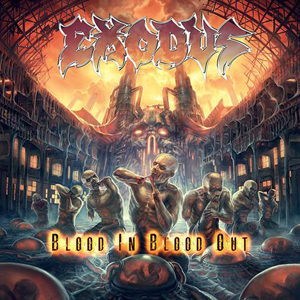 Fans clamoring for a second new track from the upcoming new EXODUS record, Blood In, Blood Out, are having their cake and eating it too! The blazing new title track, "Blood In, Blood Out", is available for streaming below. "Wrapped In The Arms Of Rage"
The digital version of Blood In, Blood Out will include the digital bonus track “Angel Of Death” (ANGEL WITCH cover). The album’s Japanese edition includes the “Protect Not Dissect” bonus track featuring Rat from THE VARUKERS/DISCHARGE.